During the Fiscal Year 2014 budget process, the advocacy group OPAL proposed that TriMet extend transfer times from the current two hours to three hours, and allow transfers issued after 7 p.m. to be valid through the end of the service day. OPAL proposed the extended transfer times to help offset the impact of fare increases and service cuts, particularly for riders who are transit dependent. Currently, TriMet allows a two-hour transfer with the intent that riders can travel to their destination on one fare. Riders making short trips can make additional trips, including round trips, before their 2-hour transfer expires. TriMet committed to review their proposal, which included an independent financial analysis by ECONorthwest. 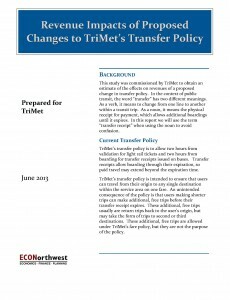 The report, “Revenue Impacts of Proposed Changes to TriMet’s Transfer Policy”, released to the public today, is based on new, updated data from TriMet and Metro’s recent travel surveys. 33 percent of typical midday riders on both weekdays and weekends would be able to travel without purchasing an additional fare. About 25 percent of riders in the morning peak-hour commute and those riding after 7 p.m. would not have to purchase a return fare. TriMet would lose between $2.15 million to $4.1 million in revenue annually. With limited resources, there are no independent financial decisions. Each decision impacts another. 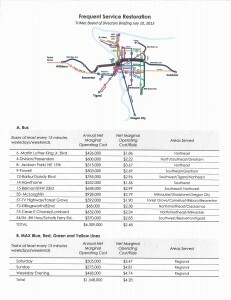 At the July 10 Board of Directors briefing, TriMet presented a preliminary overview of what it would cost to restore Frequent Service to pre-recession levels on 12 bus lines and all MAX. The 12 Frequent Service bus lines and all MAX lines would return to 15 minute or better service every day. The preliminary cost to restore Frequent Service to the 12 bus lines would cost $6.3 million. To restore the MAX Blue, Green, Red and Yellow lines to Frequent Service is estimated to cost $1.55 million. Fare revenue due to increased ridership has been subtracted from the total figures. About 72 percent of weekly transit trips are taken on the Frequent Service network. There are many unknowns on the financial front. The last union contract award is being appealed by the Amalgamated Transit Union, and the outcome of the appeal could have an impact on TriMet’s financial ability to restore service or require service cuts. Two other unknowns are the pace of the economic recovery and the payroll tax revenues, which make up the largest resources to fund transit, and the increased costs for health care benefits. TriMet is looking for feedback, so comment via comments@trimet.org or 503-238-RIDE (7433) between 8:30 a.m. and 4:30 p.m. Feedback will be presented to the Board of Directors at their July 24 board meeting.